For the sixth time in school history, the Seward County volleyball team wins the Jayhawk West title. One year after sharing that distinction with Hutchinson, Seward wins the conference by their lonesome after a 3-1 win over third place Colby Wednesday night in the Green House. Seward won 25-23, 25-10, 20-25, 25-16. The Saints hit .458 and held the Trojans to hitting .250. Giovanna Tapigliani had 16 kills and Mariana Nascimento hit .591 with 15 kills. Giovanna Kuntze had 53 kills which was the second most in a four set match this season. 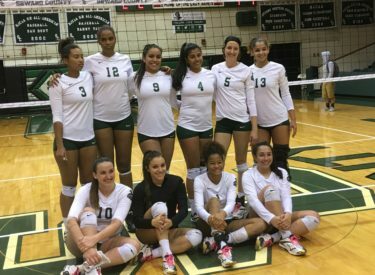 Briana Domino and Viviane Viana had 16 digs a piece. This marks Seward’s first back to back conference championships since 1999-2000. Seward also won the KJCCC West in 1999, 2000, 2003, 2009, and 2016. The Saints are now 30-1 and 15-0 in the conference. Seward hosts second place Hutchinson Saturday night at 6:30 in the Green House. The win also assures Seward of hosting the Region 6 Semifinals on November 5.